Here’s one suggested by my friend and editing colleague, Linda Bates. As a special bonus, it has a US / UK English twist. How exciting! A kerb is a noun meaning the stone edging of a pavement or path. There are some verbs associated with kerb, notably kerb-crawling, which is driving slowly on the lookout for a prostitute. Curb is a noun meaning a limit or control (“I’m imposing a curb on the amount of alcohol you can drink at home”) and a verb meaning to keep in control or limit (“I’m curbing the amount of alcohol you can drink at home”). A curb is also a type of bit used in a horse’s bridle. And, excitingly, American English uses the same word (curb) for both! I always like featuring my fellow editors in this interview series. As I’ve said many times before, I approach other editors in a spirit of cooperation, not competition. It’s important to me to support new editors, learn from more established editors, lean on and support my peers and have great people to recommend prospective clients on to when I can’t fit them in or know they would be a better fit. And it’s great to see all the different things we all get up to! So it’s with great pleasure that I come back to Tammy Ditmore for an update. Tammy’s business is called eDitmore Editorial Services. We first met Tammy in June 2012, and she updated us on her progress in June 2013 and most recently in August 2014. When I asked her then where she wanted to be now, she replied, “Probably in about the same place as I am today. I recently stepped back and took stock of my current family and life responsibilities, and I realized I just need to focus right now on keeping my business steady so that I have the time and energy to take care of these other obligations. I do have some dreams for expanding into other areas at some point, but I don’t think this will be the year for that. Admitting that I needed to take a step back — or at least not try to move forward — was hard at first, but it’s given me a greater sense of peace and helped me focus on what’s most important to me right now. I believe there are seasons to life, and I don’t want to miss this particular season by trying so hard to launch myself into the next one.” Now, Tammy has had, it’s fair to say, a tough year, but she’s learned a lot about her business and how it works with the rest of her life during that year, and is generous enough to share those lessons with us today. Hi, Tammy, and welcome back Are you where you thought you’d be when you looked forward a year ago? Yes, pretty much. It was a year of transitions for my family, and because of that I have focused a little less on my business during this time. I’m grateful that I’ve still been able to work steadily through the year with little income dropoff. I have overloaded a bit in some months so I could step back in others and spend more time with my family. I’ve had less work from some of my steadiest clients from the past few years, mainly because of turnover at those clients, I think. But I have continued to pick up new editing clients from other sources, and I’ve reconnected with a few clients from the past. The type of work I’ve been doing has remained a mixture of copy editing and developmental editing for books and other projects. But I also did a bit more writing this year, and I think there may be some opportunities soon for me to do even more writing, which I’m looking forward to. I have learned that a large project with a number of writers and specialists involved can offer some real challenges, despite all my efforts to keep things on track. I wish I had been more confident that my business really did have enough of foundation that it would not collapse if I gave it a little less attention. I’m very glad to have learned that—although I know I can’t take the business for granted either. I think it’s important to remember that we run a business; our businesses should not run us. I’m looking forward to this year. I’m headed into it with some renewed energy and ideas, and I anticipate having more time this year to concentrate on developing some new opportunities. I’m co-hosting a webinar on editing soon (this is airing live on September 30 and will be available for replays after then: follow this link for information), and I’m going to be on an editing panel at a writer’s conference in November. I’m talking with some potential clients about doing more writing, and I’m learning a new program (InCopy) for another client. By this time next year, I hope I will have some solid writing projects along with my editing projects. And I may even begin offering some consulting services this year; I’ve been doing more and more of that informally, so I’m thinking about how I could make that a part of my business services. A rather unpredictable year for Tammy, then, but she’s pulled out that important point: “It’s important to remember that we run a business; our business should not run us”. I’ll be excited to learn how her new ventures into writing and possibly consultancy go – it’s interesting to see how our careers shift and change shape as we go along – personally, I’ve ditched the writing work and have segued calls for mentoring into some new products to help people self-mentor, but I love to see how other people face those challenges. Tammy’s website is at www.editmore.com and you can of course contact her by email. She’s based in Califormia. And here’s the event on September 30 again: How to Team Up with the Perfect Editor for you. Hooray, I seem to be doing these posts more regularly again now. They have lots of fans, so hope regular readers are pleased. Of course, if you’ve just found this post having searched for “altar or alter”, you’re going to be a bit confused by that statement, as you’re visiting from way in the future. This “Troublesome Pair” is but one of a whole series of them I’ve been posting for a few years now. Do pop to the links at the bottom of this post to find the whole alphabetical list of them! Right, anyway … alter or altar? Altar is a noun and refers to specifically the table in a Christian church, usually at the front, where the bread and wine are consecrated for communion, and more generally, to any flat-topped box or table that is used as the focus for some kind of religious ritual. Bonus pair: What’s a shrine, then? A shrine is a place that’s regarded as being sacreed or holy because it’s associated with some kind of god / deity, or a reliquary or container containing holy relics. So you do religious things at an altar and a shrine keeps them safe. It’s time for a Small Business Chat update, and I’m thrilled to be interviewing the lovely Tone Hitchcock of Anthony Hitchcock Art & Design for the fourth time (his sister and cousin also feature in this series, coming soon!). 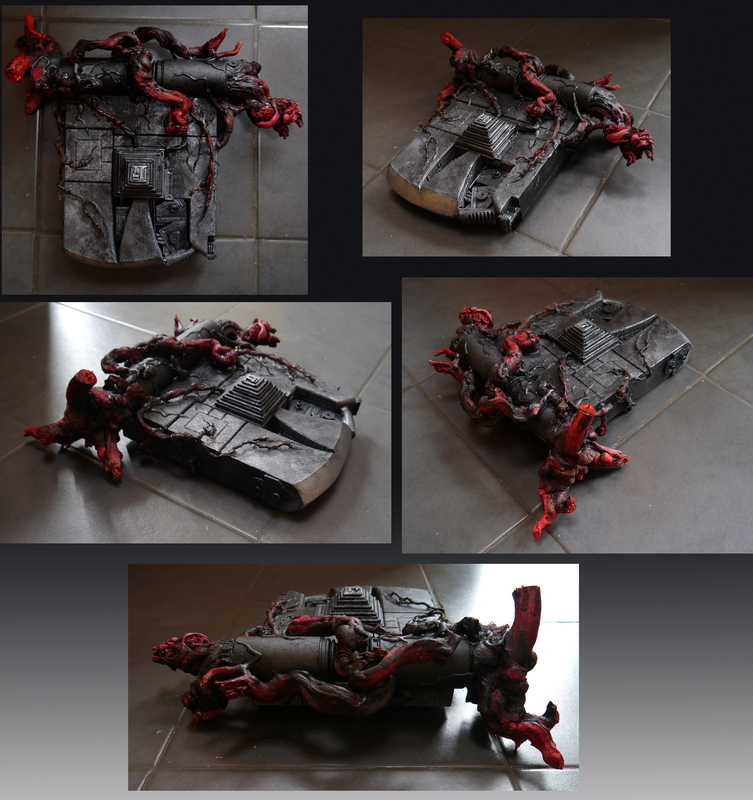 Tone is a model-maker extraordinaire, and it’s lovely to see him being able to forge and strengthen his career in this creative corner of the self-employment world. first interviewed Tone in May 2012 and then we did an update in June 2013. The last update was in July 2014, at which point, when asked where he wanted to be in a year’s time, he repeated his reply from last time: “This time next year, Rodders…” Let’s see how he’s been getting on, and he’s treated us to some fab photos of some of his work again, too! Sounds exciting! What has changed and what has stayed the same? I’m still doing props and models, with the occasional bout of doodling, but this year I’ve completed some work for Bristol Museum, in conjunction with Cheltenham Science Festival. I sculpted a lifesize Pliosaurus skull for them, working from the actual fossil, which is not yet on display at the museum, which meant that I got to poke around ‘backstage’ there, which for a massive nerd like me was a real thrill. The fossil itself was found in Westbury, about 8 miles from my house, and represents a new species (P carpenter), so it is a properly West Country beastie. So far, the feedback I’ve had on it from Paleontologists has been very complimentary. After tightening up my paperwork, and client-vetting bureaucracy, this year seems to be running more smoothly, too. I’ve been able to head off the nutters fairly early for a change! There were a couple of slow patches this year, so I guess the important thing I’ve learnt is perseverance. You can’t just sit around and wait for things to fall into your lap, you need to get out and find opportunity. I hate to use the phrase ‘networking’, as it sounds so cheesy and calculating, but it is a very necessary thing. I’m probably quite lucky in that a lot of my more useful contacts have grown about quite organically, through mutual interest and friendship, rather than being approached from a business point of view. A case in point is Ben Garrod (Evolutionary biologist, one of only a handful of people in the world who re-articulates skeletons for museums, presenter of the BBC 4 series ‘The Secrets of Bones,’ and all round good egg), who I met on Facebook a couple of years ago. What started as bonding and banter over our skull collections led to Ben putting my name forward when Bristol Museum mentioned to him that they were looking for a sculptor. The usual tips: keep going! And also, make the most of every opportunity you can, as you never know where it could lead. I recently appeared as an extra in a Hollywood production being filmed in Wells (they were looking for long-haired beardy men, and it’s only down the road, so it seemed silly not to apply for it), and as well as being a laugh, it afforded me the chance to give out my card to a few industry types, and also to make a pair of signet rings for my similarly hirsute cousin and me to wear on the day of shooting. This is a re-post of an older post that was attracting lots of spam comments, reposting it to see if it helps. 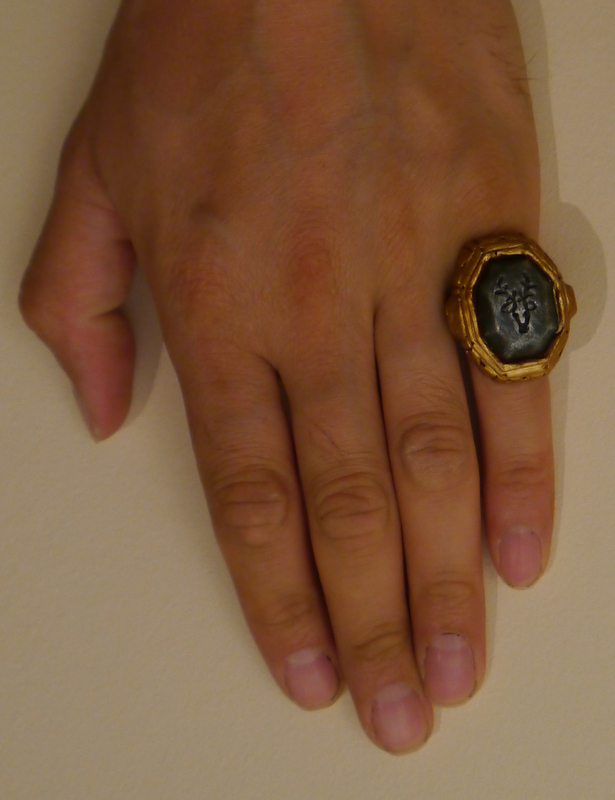 But it is a useful post, still, so do read, enjoy and share! 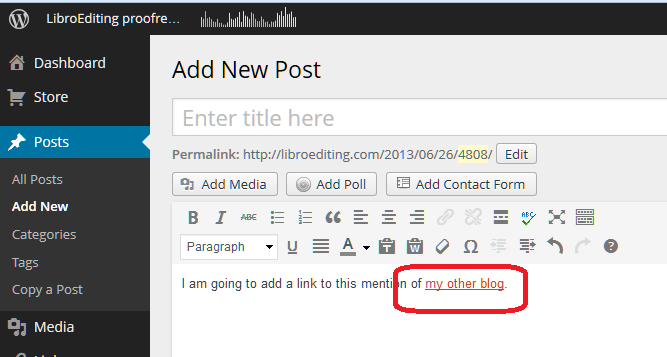 Why would I add a link to a blog post? And did you notice that all of those bullet points were links to examples of what I was talking about? One major advantage of links is in helping your Search Engine Optimisation (SEO). I’m not going to go deeply into that here, but basically, Google and the other search engines like to see your pages linked to on other people’s pages, as it shows you’re trustworthy and respected within your community enough for people to link back to you. Yes, people do try to abuse this (we’ve all had blog “comments” from spammers trying to get their URL on your list of comments and now we know why) but when used properly, reciprocal linking to content that does actually interest you and is relevant for your readers does help your fellow bloggers and will hopefully lead to them linking to you, too. How do I add a link to my blog post? Of course, all of the blogging platforms (WordPress, LiveJournal, Blogger and others) do it slightly differently. But the difference usually comes down to the icon that they use and how much you can do once you’ve clicked on that icon. I’m going to use WordPress as the main example, showing all the steps to create a link, but then I’ll show you what the link button looks like in Blogger and LiveJournal and, in fact, Gmail, too. And at the end I’ll share those link images so you know what to look out for. How do I add a link to a WordPress blog post? 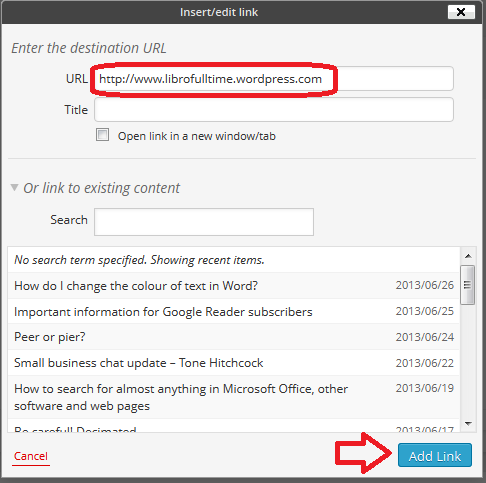 WordPress allows you to do two things here; you can either link to a URL for a page outside your own blog (circled in red) or you can choose one of your own previous blog posts to link to (circled in blue) – very handy. Note here that I’m read to hit Add Link and I have NOT ticked Open link in a new window/tab. This is because I used to do that and an experienced website manager I know got into a bit of a frenzy and told me that it’s not good practice and I should NOT do that. So I don’t now. 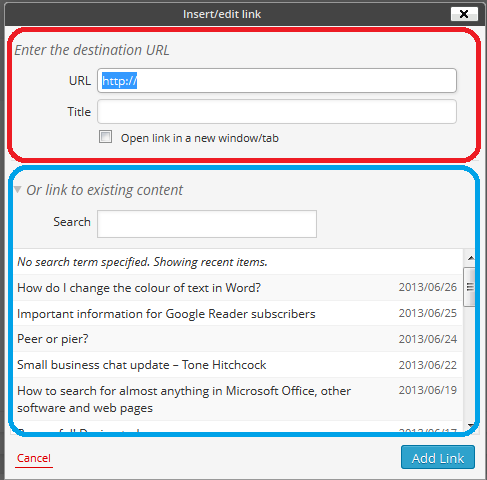 Note: if you want to open a link in a new window or tab when you’re reading a blog or web page, right-click on that link and you should get a list of options including those. … and it will be a link just like the ones in the first section, above. If you want to edit the link, highlight the underlined text and click on the same Link button – you can now change it as you wish. If you want to delete the link, highlight the underlines text and click on the icon to the right, which is supposed to look like a link being broken (or a staple being removed). How do I add a link to a Blogger blog post? 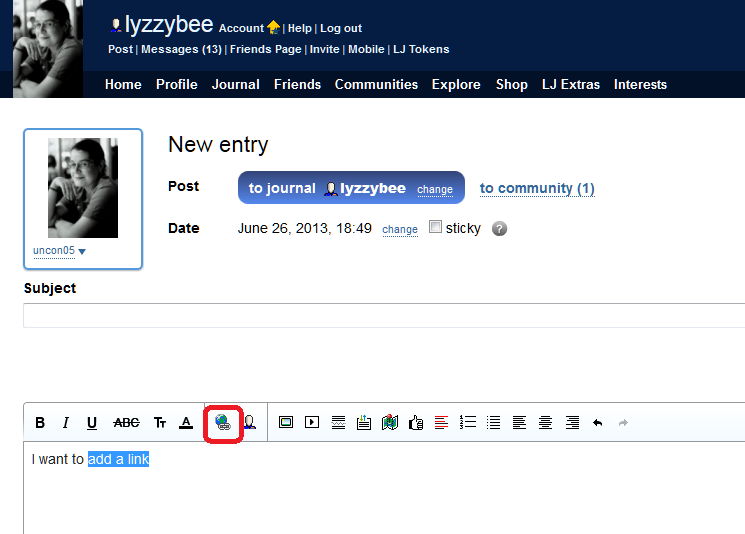 How do I add a link to a LiveJournal blog post? and you’ll get a similar dialogue box when you click that icon. 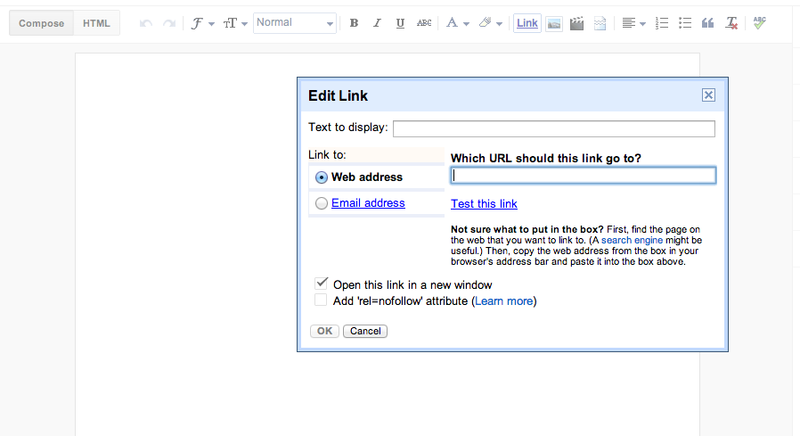 How do I add a link to a Weebly blog post? 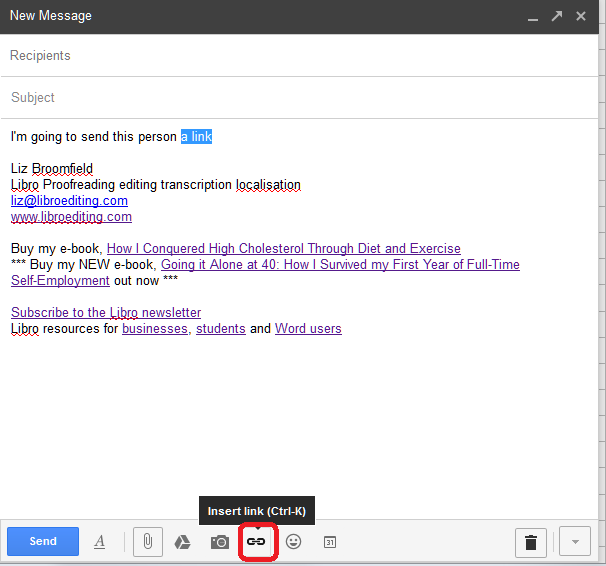 How do I add a link to a Gmail email? Here are those common icons again. If you find another one, do contact me and send me a screenshot and I’ll add it to this post! Hooray, it’s time for another Troublesome Pair (for any new readers, this was a series I used to run that I’ve recently restarted). This is another one suggested by my Australian friend Matt Patten, as he spotted an example just the other day. A hanger is something that you hang something from – a clothes hanger being the obvious example. A hangar is the big shed that an aeroplane lives in. Nothing more I can say, really! It’s time for an update with Diane Grogan from Kanine Kampus and Pet Au Purrs, a dog day-care company in Oldham, who we first met in May 2013 and updated in August 2014. At that point, they’d just moved business premises and Diane had good advice to give about checking business rates, etc. This is where she wanted to be by now: “We are seeing a light at the end of a very long tunnel, and if we keep our heads down and work hard we will be on track to continue and expand towards the end of next year”, but as you’ll see as you read on, it’s been a year of decisions and (positive) changes to get back on track. As Diane said when she replied to my update request, “Lots of things have changed since last year, so it’s a good thing to be updating people”. Hello again, Diane. Are you where you thought you’d be when you looked forward a year ago? Not quite: we realised that we were never going to be able to afford the building we were in, as the rent and business rates were going up each year, and we would have had to hike up our prices to break even. We also had two new day-care centres open close enough to affect us, so we decided to call it a day, ease the worries and just step back into the dog home boarding, dog walking, dog grooming and pet sitting that we ran alongside the day-care. We no longer have the day-care centre, but still offer group dog walking where dogs can spend four hours or more in the company of other dogs (up to four at a time ) in the fresh air and open countryside, as well as our other core services. To stop worrying so much and go with what you know. Research the rent and rates on a building, as they are often not clearly advertised; also look into electricity costs and other utilities. I am really enjoying being back outdoors, I feel healthier and happier without being dragged down with paperwork and jumping through hoops with councils and licences, So I intend to keep doing what I’m doing and enjoy the work. I’ve always been so glad I don’t have to have anything to do with facilities or business premises as a sole trader working on a computer at a desk; they can be very tricky, not to mention expensive, things to deal with. I’m glad that Diane’s made the right decision for her business and herself, and is feeling better and less weighed down for it. Here’s to a good year! You can visit Kanine Kampus and Pet Au Purrs at www.pet-au-purrs.com, phone Diane or Paddy on 07942 892 728 or visit their Facebook page.